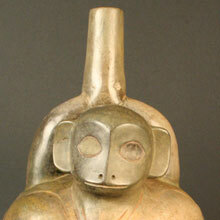 The Parakas people inhabited valleys such as Ica and Pisco in what is now the southern coast of Peru. This desert zone faces a seacoast that is rich in natural resources. 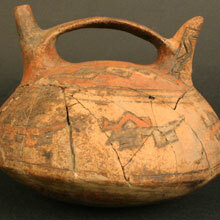 The Parakas were an agricultural people, growing maize, squash, cotton, beans and yuca. However, they obtained most of their food from the sea by fishing, hunting marine mammals, and gathering shellfish, seaweed and other products. While they were a society of farmers and fishers, they are known among other things for the expertise of their medicine men, who successfully performed complicated trepanations (making a hole in the skull). Parakas ceramic bottles feature bridge-handles and double necks, and many of them were painted with resinous pigments after firing, giving them vibrant colors such as blue, yellow, red, orange, green and brown. However, the Parakas craftspeople were most skilled in textile making, producing multicolored cloth of excellent quality. Their early work includes double cloth textiles and gauze embroidered with animal motifs in light blue, yellow, brown, white and black yarn. Later, human figures begin to appear, holding severed trophy heads in one hand and weapons in the other. The Parakas used a variety of techniques to decorate the cloth they wove that ranged from dyeing to embroidering three-dimensional figures. Their other forms of artistic expression include goldcraft, fire engraved gourds and featherwork. Owing to the limited information available, we do not know for certain how Parakas society was organized, though there is evidence of some degree of social stratification. 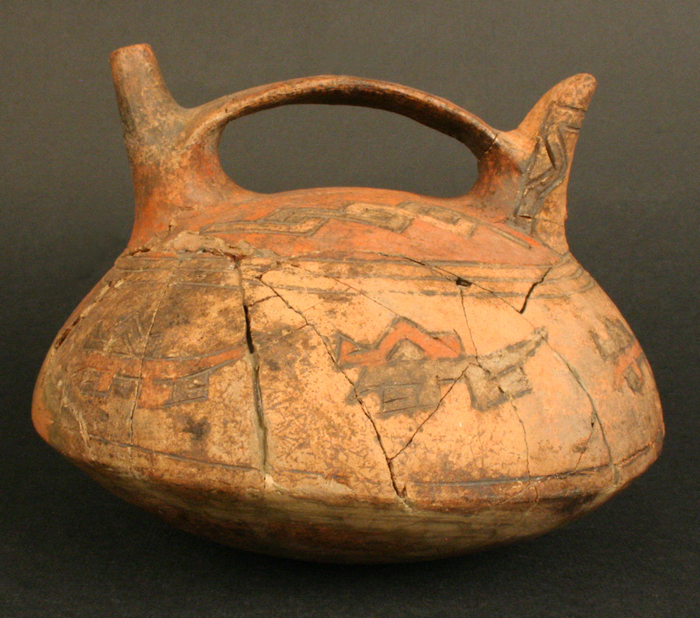 Such differences are suggested by variations in funerary offerings left in tombs ascribed to this culture. The few individuals buried with a rich array of grave goods are thought to have been of high rank. The cult of the dead appears to have been very important to the Parakas people. The bodies that have been found were placed fully clothed in a squatting position inside woven baskets that were then wrapped with alternate layers of plain and embroidered cloth, with some funeral bundles having up to 20 such layers. Between the layers of cloth they deposited offerings such as musical instruments, feather fans, combs, miniature pieces of cloth, and other items. Many of these pieces were covered with images of fantastic beings. Individuals with feline, serpent or marine animal features, and human figures spitting out mythological animals and bearing a variety of weapons probably represented deities that occupied a central place in the rites and worship of the dead in Parakas culture. A notable figure in Parakas iconography is “the Sacrificer”, who was usually depicted holding a severed head in one hand and an axe in the other. Most Parakas settlements found to date were seasonal camps close to the coast and at the edges of valleys. The constructions found at these sites consist of rooms built together to form houses or groups of houses. These had walls of stone mortared with seaweed and filled in with waste and shell rubble. In later times, the Parakas built larger settlements around temples made of adobe mounds. 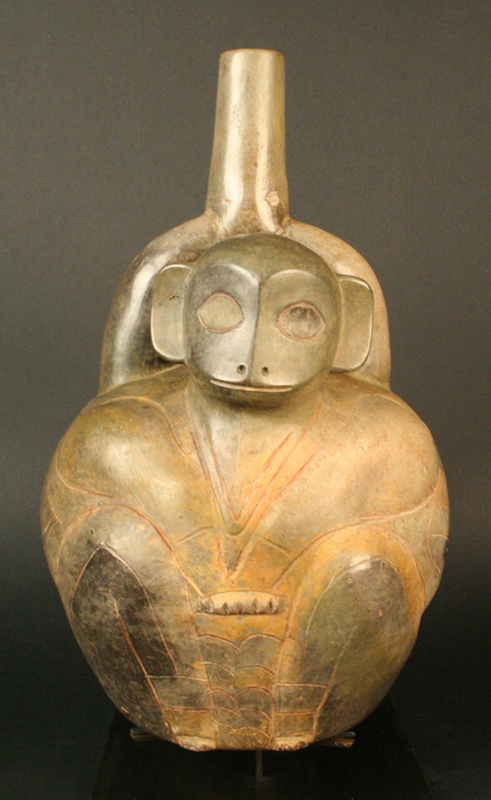 Initially, the Parakas culture was heavily influenced by the Chavín culture, although over time it acquired its own distinctive features, notable among which is the rich polychromy of its artistic work. This polychromatic legacy left its mark in southern Peru and reached its highest expression in the Nazcas, who were the direct heirs of the Parakas tradition. Formativo Tardío 200 - 600 a.C.